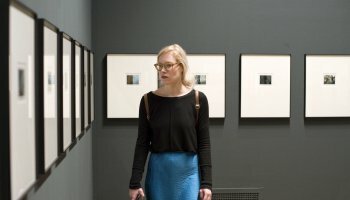 In 2008, the exhibitions Weegee - from the Berinson collection, Kors's Choice, and The Hyena & Other Men from the South African photographer Pieter Hugo receive a lot of attention. The photography festival Foam_fusion, which is organised for the second time, welcomes a great number of visitors, both national and international. Many visitors return to Foam multiple times in the same year due to the ever-changing exhibitions. The legendary photographer Weegee (b. Usher Fellig, 1899) is regarded as the prototypical modern photojournalist and one of the most important photographers of the 20th century. His photographs have an immediate, almost violent impact. They show crimes and accidents in the New York of the 1930s and 1940s, but also simply life and events on the streets of the city. This is the single most important and most extensive collection of Weegee’s work made up exclusively of original vintage prints. The exhibition by German artist duo Daniel & Geo Fuchs opens up the hidden rooms once used by the STASI, the infamous East German secret service, in a series of monumental photos. While much of the former DDR infrastructure has been destroyed, or given an entirely new function, the clandestine spaces that Daniel and Geo Fuchs photographed are still in their original condition. The typical Eastern European interiors, with their functional furniture and sober colours seem remarkably styled in retrospect; but most of all, what this large, intriguing project shows is the symbiosis of architecture, power and powerlessness. Made possible thanks to by Allianz Kulturstiftung, the Stiftung Aufarbeitung, the Goethe Institut and the Duitsland Instituut. Foam_fusion is a dynamic weekend aimed at a wide audience of photography enthusiasts. 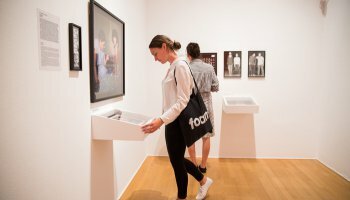 For two days, Foam is a place where guests and visitors from The Netherlands and abroad meet each other. The programme includes a range of activities: films and documentaries, presentations and slide shows, discussions and debates, dialogues, workshops, portfolio discussions, a photo book market, a dance performance and much more. Malick Sidibé (b. 1935) is the éminence grise of African photography. 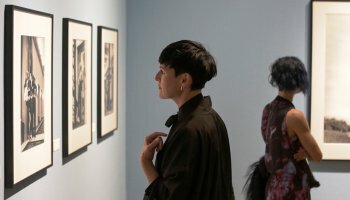 The centrepiece of the show Chemises is a series of original chemises, coloured sheets of card on which Sidibé pasted small prints of the photos he took at parties and events in Bamako, the capital of Mali, between 1962 and 1973. Partygoers were able to view and order copies of photos after the event. The chemises are accompanied by numerous portraits taken by Sidibé in the 1970s at his studio in Bagadadji, a working-class area of Bamako. Together the displays offer a unique and often heartwarming insight into Malinese society in the early years following independence. The exhibition was made possible with the support of Gwinzegal. Made possible thanks to NCDO. In collaboration with the Prince Claus Fund. In 1956, at the height of the Cold War, Kor van Bennekom began working as a photographer for the communist newspaper De Waarheid. His photos provide a magnificent record of ordinary, hard-working people in a city rebuilding after the war, racked by poverty and unrest. From 1966 onwards Van Bennekom brought street photography into the theatre, portraying Dutch and international actors, musicians, ballet dancers and cabaret artists in a bold and vibrant style. And all the while, Van Bennekom also photographed his family. Kor van Bennekom is a combination of street photographer, theatre photographer and family photographer, whose remarkable oeuvre reflects the history of the Netherlands. This show, featuring many unique photos, is opened by Job Cohen, mayor of Amsterdam. Foam presents the first European retrospective of Japanese photographer Miyako Ishiuchi (b. 1947). A central theme in her work is the way time leaves traces on objects and the human body. She finds beauty in places where we typically would not look. The artist brought attention to herself at Biennial 2005 in Venice with her collection Mother’s, but the remainder of her work had not yet been presented collectively in Europe. Foam aims to remedy this with an exhibition of over ninety of her works. Organized and produced in part by Langhans Galerie Praha, a non-profit organization for the promotion of photography. Helen Levitt (b. 1913, New York). Inspired by her mentors and friends Walker Evans and Henri Cartier-Bresson, Levitt recorded life on the streets of 1940s New York in black-and-white photos. Her work set the tone for a new documentary style in American photography. In the Street features a series of contact sheets that show how Levitt moved about when photographing on the streets, recording the choreography of the people around her. Helen Levitt was also a pioneer of colour photography. In addition to her black-and-white photos, the exhibition also features a selection of her famous dye-transfers (colour photos). Thanks to Laurence Miller Gallery, New York. In March 2008, Hugo was selected by an international jury as winner of the KLM Paul Huf Award 2008. Due to this, his exhibition The Hyena & Other Men is shown in Foam. Pieter Hugo travelled to Nigeria twice (in 2005 and 2007) to follow a legendary group of itinerant street artists known as the Hyena Men. These men earn their money by performing on the streets with hyenas, pythons and baboons, and by selling traditional medicines. In his monumental portraits Hugo manages to capture the complex interaction between the dressers and their animals. The third annual Talent Issue showcases the work of 12 young talented photographers aged between 18 - 35 selected from Foam’s annual Talent Call. Chosen from over 300 portfolios submitted from every region of the globe from Africa to Asia, Europe to South America - the Talent Issue aims to collate and investigate the future of photography.